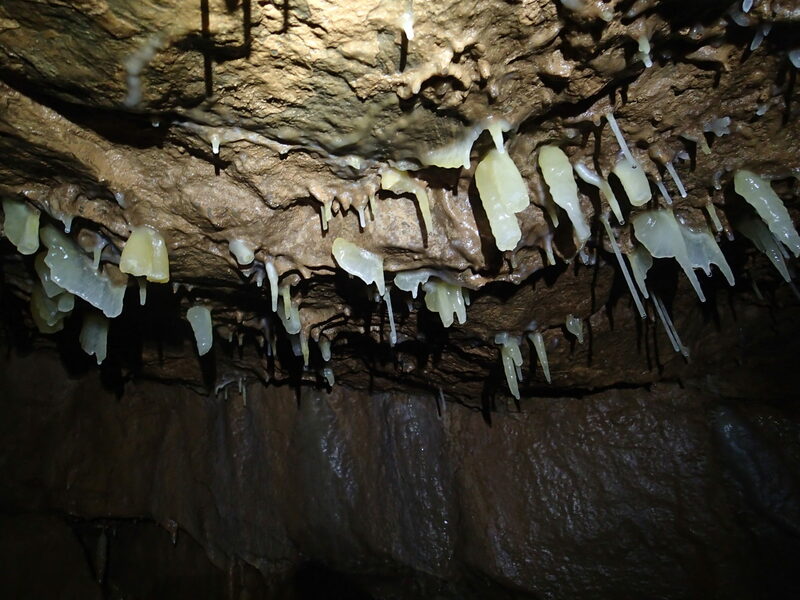 Following the horrific vandalism in Mendip’s Hunter’s Lodge Inn Sink two years ago, cavers have worked hard to repair as much of the damage as possible. Estelle Sandford tells the story of their efforts. At the lower end of Happy Hour Highway there was a beautiful area of stal, with some 40+ stalactites, straws and mini-curtains, some of them in a stunningly gorgeous orangey colour, but something you admired the beauty of had been reduced to shattered pieces on the floor. Just beyond that, as shown in the next photo, you can see the white stal bank on the left has brown marks all over it; these are clearly handprints and footprints. Most of the broken off stal lies just to the right of the stal bank with some of it over the tape to the right by several metres. It had clearly taken a deliberate swipe to break so many formations like this. There are no words that can describe just how gutting it is seeing this sort of vandalism, particularly in a cave I’d helped to dig and explore originally. 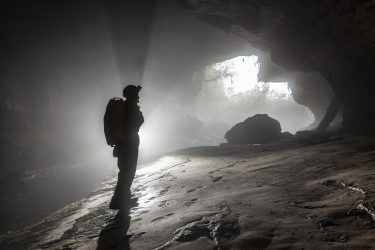 What sort of person, who has to be some sort of ‘caver’ (in the loosest of terms as they would have had to ask Roger Dors, the landlord of the cavers’ pub for the key! 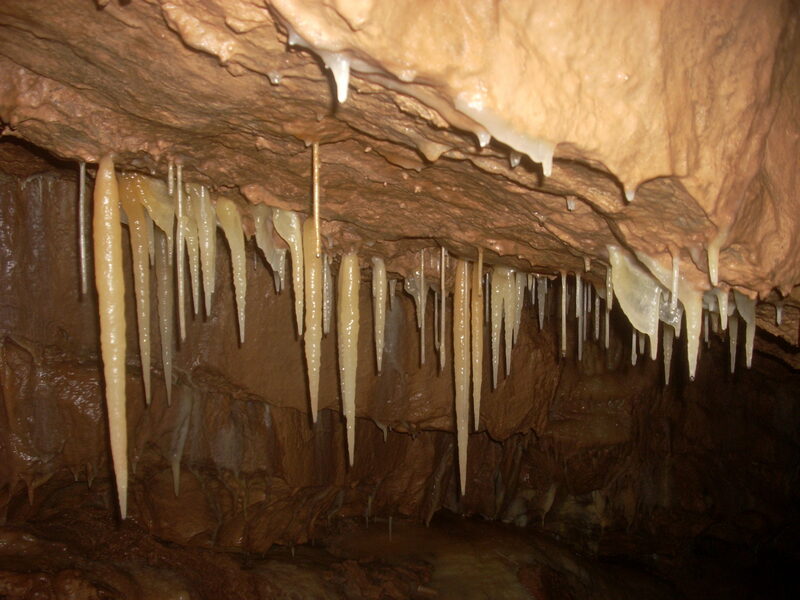 ), would do this sort of damage deliberately to a cave? What possible motive could they have had? 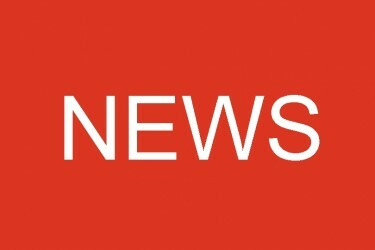 Despite efforts in the public domain to attempt to gain more information about any individuals involved, nothing has been forthcoming to identify them. All we know is that it has to have happened at some point between January 16 and March 6 2016. 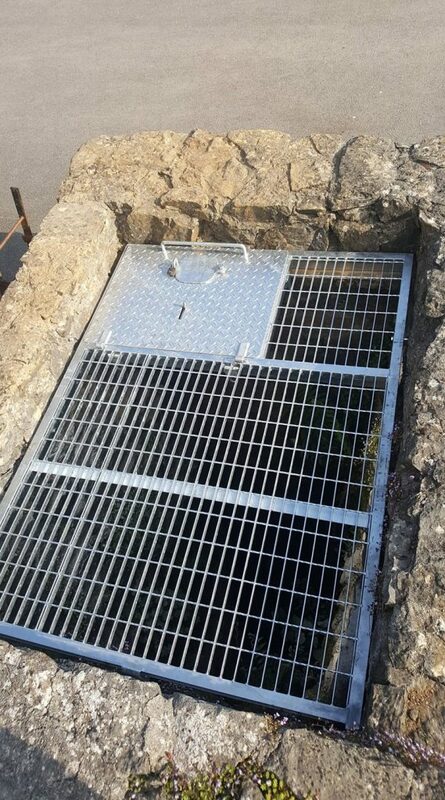 After that trip, the cave remained closed for maintenance and repairs until, on May 19 2018, the CSCC fitted a new specially engineered gate to the entrance and the entrance fixed ladder was removed and Roger Dors agreed to the reopening. There are two solid rings welded onto the new entrance gate for fixing a 5m ladder and lifeline to, which are recommended due to the slipperiness of the entrance. The gate is similar to many others on Mendip where you don’t need the key to get out – it’s easily opened from the inside whilst leaving the cave secure while you are underground. The key is, as previously, available from Roger Dors. 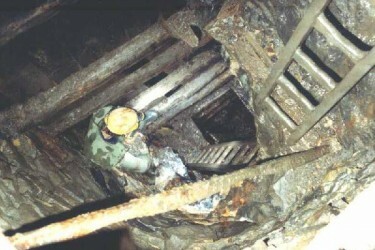 Following on from discovering the damage, a group of us, primarily Duncan Simey, James Begley, Mike Moxon and myself, accompanied by various others during the time, spent just over a year doing regular trips into the cave to try to repair the stal using primarily superglue and activator – and also thoroughly cleaned and retaped the entire cave. Sometimes I think there is no real transition from when a dig becomes a cave and this was a good example. 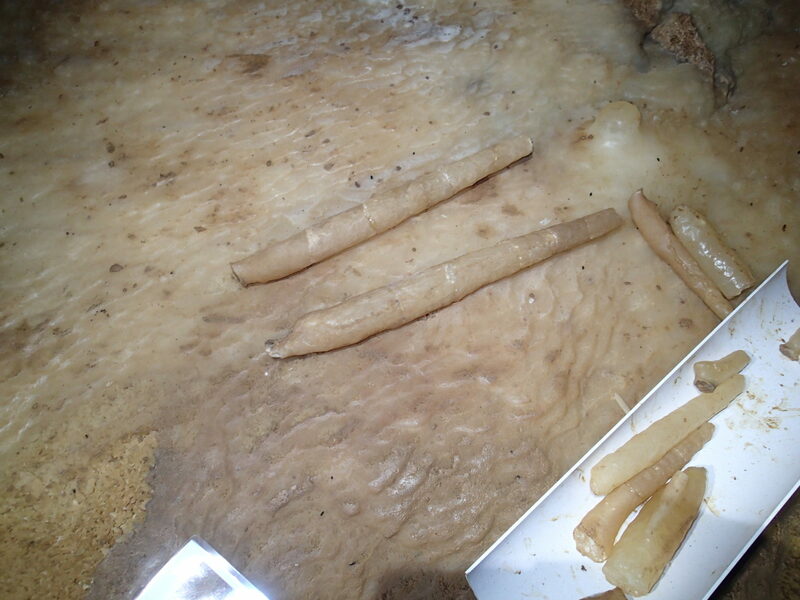 The tape was a bit random and as it was just mostly laid on the floor, it had crept and made pathways wider, and also damaged quite a lot of floor formations, plus there was quite a bit of digging detritus left in the cave. 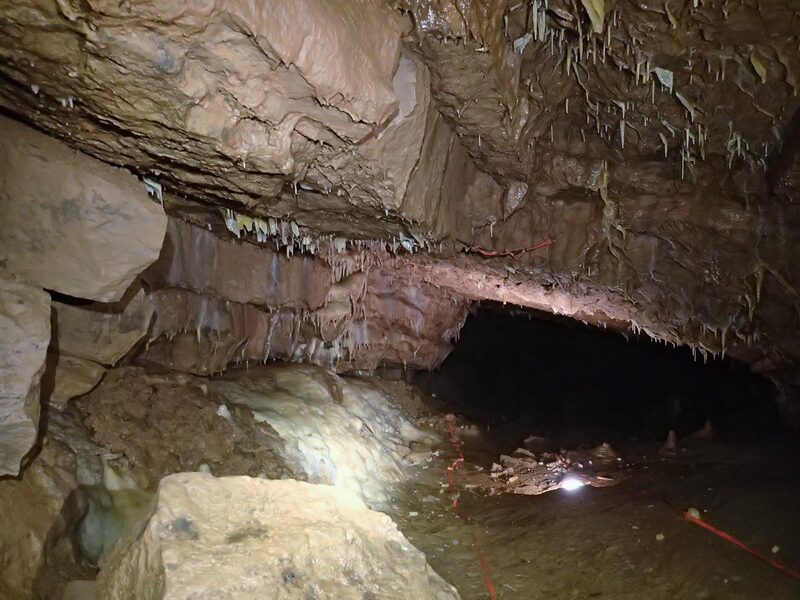 Thanks to the CSCC for providing new tape and risers, we used a lot of risers which have fixed the tape so the path is narrower and more obvious throughout the system, protecting the formations and archaeology throughout the cave. We completed the final working trip in April 2017 when we re-taped the last of Happy Hour Highway and tidied up the remaining stal we couldn’t repair into a neat pile as a sad memory of what happened. My photos of the damage and the repair work can be seen here. Photos by Tim Rose of the cave before the damage was done can be found here.